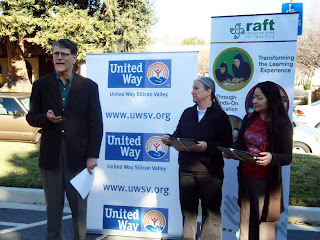 On a day when schools were closed to honor Martin Luther King, Jr., nearly 100 adult and youth volunteers joined United Way Silicon Valley and Resource Area For Teaching (RAFT) to make the holiday a “day on” instead of a “day off” by working to improve local education and lending their support to local educators. 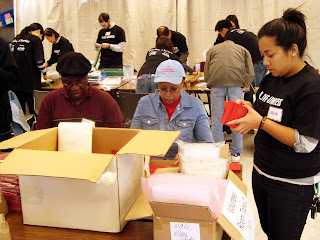 As part of this nationally recognized King Day of Service, local volunteers assembled hands-on RAFT Activity Kits including ‘Water Beads’, ‘Place your number value’! and ‘Catch a falling ring’ and other materials that teachers can use in the classroom to create valuable learning opportunities. On this Day of Service, RAFT also honored two Bay Area educators with the Hands-On Recognition Awards. Ann Shioji a high school integrated Science teacher and Anna Pollock, a physician who changed careers to become an elementary teacher, were recognized for their creative and outstanding work using hands-on activities to engage their students. As Hands-On Recognition Award winners, each will receive two years of free RAFT membership and $100 worth of RAFT Gift Cards.